This Shared Event has been completed. 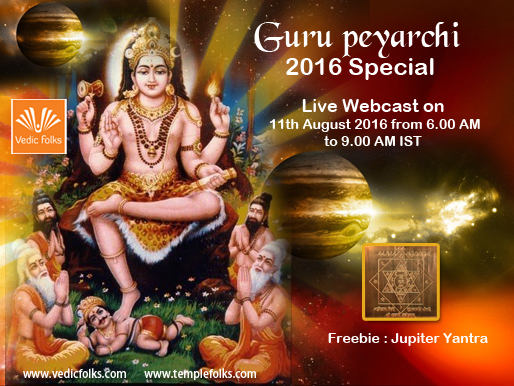 Eliminate the malefic effects of Guru and receives blessing by performing Guru Peyarchi 2016 Homam..!! Jupiter is also known as Brihaspati or Guru. Lord Brihaspati was born to saint Angris, who is the son of Lord Brahma and Chiratha devi. His wife is Gnana devi and their sons are Kasan and Bharadwaja muni. He signifies Lord Dhakshinamurthi who is renowned for protecting his devotees from darkness and ignorance. Jupiter is generally called "Devta Guru” or the "Mentor of deities”, the predominant teacher of devas and the God of Wisdom. Jupiter’s favourabe position in this Guru Peyarchi will make one truthful, honest, and gives him a divine grace. This Navagraha is also recognized for Wisdom, meditation, Purity, and Justice. Offer a Guru Peyarchi 2016 Homam to Jupiter and please him to mitigate the negative effects of this Jupiter Transit 2016. Jupiter transit 2016 Homa is very important in astrology since major events happen only when the ruling planets are favorable in one’s horoscope. Jupiter is a benefic planet which takes 12 years to complete a full zodiac circle. It resides in each sign for a year during which it allows and promotes fortune, wealth, growth, expansion, joy etc… Jupiter is responsible for Marriage. If it is exalted in its own house then it gives happiness and added benefits. Jupiter is completely a subha graha and his support is very important to achieve success in life. Favourable position of Jupiter during this transit will be the stepping stone for auspicious ceremonies especially for marriage alliances, child birth, change in Job, buying fixed assets, success in education or career, foreign travel, etc. His unfavourable condition may cause all sorts of trouble and difficulties in one’s life. It may make your monetary transactions unsteady, health may deteriorate and your relationships may become unstable. Help yourself from all these malefic effects by performing this Homam. Paying devotion to Jupiter during this Jupiter Transit 2016 will also nullify all the Doshas, Karma in your natal chart. Opportunity for buying material prospects. Mitigates the malefic effects of Jupiter. Exalts the benefits obtained from the favourable position of Jupiter. Eradicates the obstacles in one’s professional and personal life. Devotees performing this homa will receive a Energized Jupiter Yantra. Offer poojas to this yantra by chanting this mantra "Om Gurave Namaha" for 108 times on a regular basis to have a blessed life.